This is another tea that I purchased from DavidsTea in one of their ‘rainbow’ tins. It is 85g of Birthday Cake tea in a red tin, which worked out to be $15 per tin or 3 tins for $30. I find that this lid is a bit tougher to remove than the tin for my Cream of Earl Grey, also by DavidsTea. I had a lot of high hopes for this tea because of it’s name and I had read reviews about it before online. The tea comes in a sealed plastic bag that is resealable. There is a very in-your-face vanilla cake smell that reminds me of boxed cakes or grocery store sheet cakes. The smell almost has a bit of a pancake syrup or artificial maple syrup quality to it. The sprinkles are very pretty addition to the vanilla cake-scented tea. Birthday Cake has a lot of ingredients. 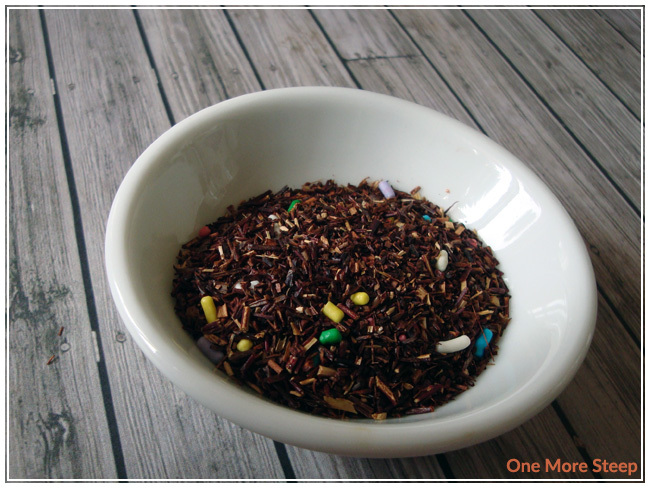 It contains: red and green rooibos, honeybush, sprinkles, ice cream bits, natural and artificial flavouring. If you’re allergic to any colouring additives, this tea contains: Yellow 5 Lake, Blue 1 Lake, Red 40 Lake, Red 3, Blue 1, Red 40. The recommendations for preparing Birthday Cake is to use 96°C (205°F) water and to steep for 4-7 minutes. I opted to steep my cup of tea for the full 7 minutes because at 5 minutes the sprinkles weren’t dissolved yet. It smells very much like vanilla box cake when it’s steeping. There’s some oil on the top, which I would say is likely from the sprinkles (they contain partially hydrogenated vegetable oil). Having an oily sheen is a little off putting – but the sprinkles were super cute so I’ll give it a pass. It smells like a very sweet tea though, even before I take a sip. The tea is a beautiful reddish brown colour. 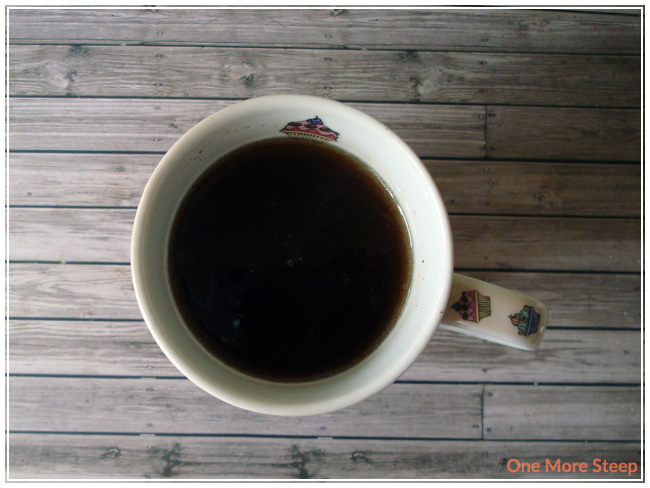 On first sip, the first thing I note is the sweetness. And more sweetness. Perhaps it wasn’t the best idea to wait for all of the sprinkles to dissolve first if you’re not into very sweet things, but I really like my desserts so this really fits the bill for me! I can definitely taste the rooibos, along with a lot of sugar and notes of vanilla. While I wouldn’t say that the tea actually tastes like cake of any sort after steeping, it does smell like it and it does taste very good. Upon second steeping, the tea does not have the same level of sweetness (the sprinkles had all dissolved for cup number one). The overall taste of vanilla is still present, and it tastes a lot like a more subdued version of Birthday Cake, and I still like it. I can’t see the tea holding up for a third steeping as well as a second, so keep that in mind. I would recommend the addition of a sweetener if you want to make your second steeping as good as the first. 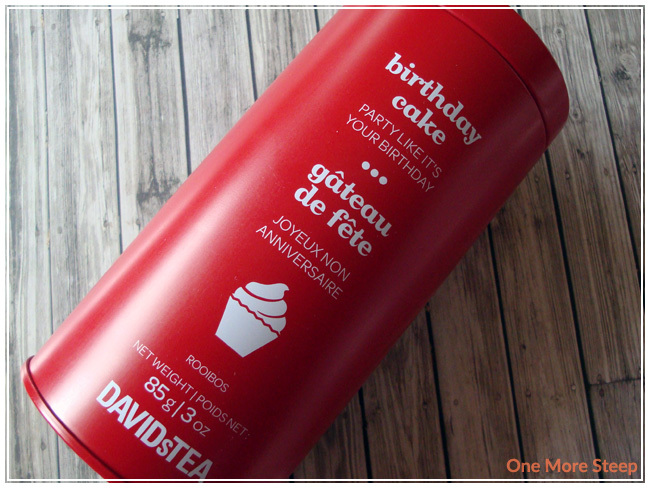 I loved DavidsTea’s Birthday Cake! Once I got past the fact that there was oil (!) on top of my tea, it was a truly enjoyable tea. The bonus of it being a rooibos tea is that it is naturally caffeine free, which makes for a tea that can be consumed any time of the day. It’s a very good dessert tea that I think would compliment actually having cake or other sweets well – or just by itself if you’re looking for something that it’s a little sweet. If you’re not into sprinkles in your tea, or drinking an abundance of artificial colouring, this is not the tea for you. SPRINKLES IN TEA. THE BANE OF MY EXISTENCE. But good to hear you liked it, especially since those tins are pretty big! I thought I would get email notifications for replies, but I guess not? It is so delicious! 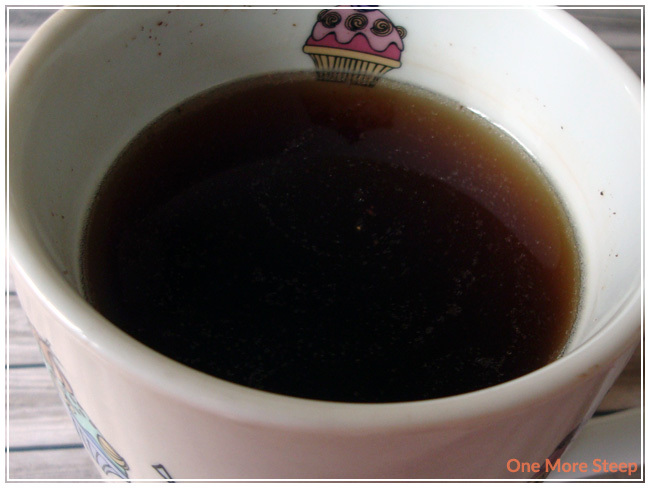 I added cream and a sugar cube and it was like drinking warm cake. So good!!! Twitter and I will make sure I post a link back to you from my site!